The next meeting will be at Pedro’s Castle starting at 7:15 PM onwards on Thursday 14th March. All are welcome and there is no charge for occasional visitors. Ring or email me if the weather looks bad and you are still intending on coming. Meetings are cancelled if there is more than 50 percent cloud cover. So let’s move on to what’s going on this month –. Comet Pan-STARRS has been putting on a show south of the Equator but now its orbit takes it into the Northern Hemisphere. The first easy chance to see the comet will be on March 12th when the comet will be close by a near-new moon or why not come to the Society meeting on the 14th? Look to the West after sunset- it will not a bright object but with luck will be visible as a smudge in the evening twilight. Binoculars will help but please ensure the sun has safely set. 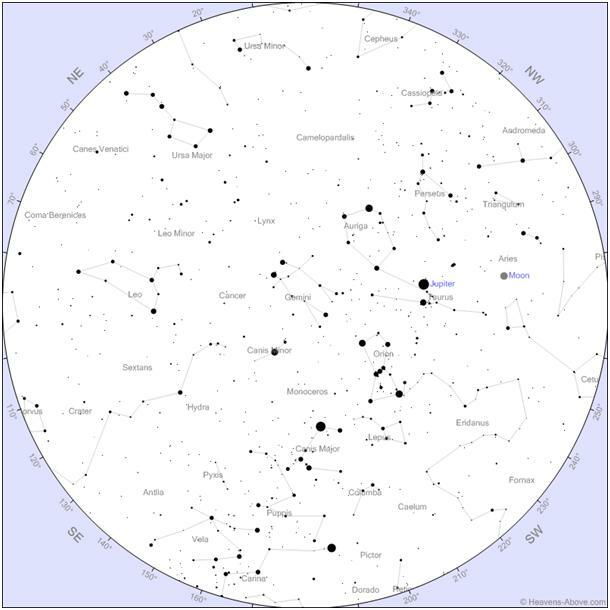 Those with Internet access go to http://www.skyandtelescope.com/observing/ataglance for a very simplified chart showing its visibility after sunset. The comet should be visible next month too but will be very much fainter. The name of the comet is interesting. Only a few years ago, comets were discovered by keen amateur astronomers with no more than a pair of good binoculars. More recently – unless the discovery has been a lone non-professional astronomer, the discovery has been named after the telescope, or even more recently by networks of robotic telescopes. Pann-STARRS is such an array based in Hawaii designed to detect near-Earth objects, its funding is mainly from the US Air Force but also includes academic institutions world-wide including the UK and Germany. Interestingly we have another bright comet later this year – Comet ISON is named after another International network of telescopes – this one is predominantly Russian Federation (is there such a thing?) in funding but with input from other countries such as Switzerland and Spain (ok ,ESA) . Comet ISON will either be spectacle or a damp squib, who remembers Kohoutek?!! 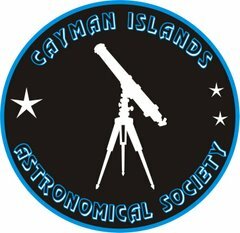 Meanwhile let’s have a quick look at the night sky for around 15th February 8 PM EST as seen from Spotts Beach, Grand Cayman. 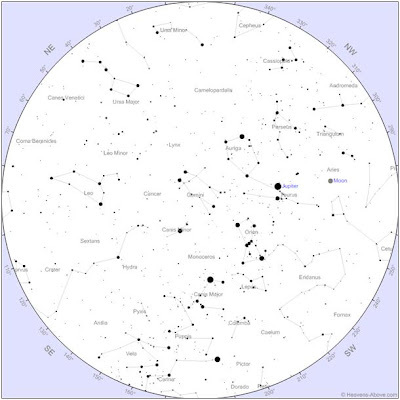 The chart below comes with the permission of Chris Peat who runs the excellent Heavens’ Above website (http://www.heavens-above.com) it’s also very good for predicting satellite crossings. The chart shows Jupiter still high in the sky close to Aldebaran in Taurus the Bull. Orion is still easily visible too. Look out for Leo (The Lion) rising in the East. Some three hours later at around 11 PM Leo will now be nearly overhead, and at this time it will be majestic Saturn rising in the East.